Iced coffee is one of my favorite summer drinks. In fact, I’m enjoying a glass right now. While I love iced coffee, I don’t love paying coffee shop prices – over $3 a cup here! You can make this batch of Cold Brewed Coffee for less than a dollar – about 50 cents to be exact. Who doesn’t love saving a little coin while enjoying an awesome treat?! You can certainly use leftover coffee if you have it, but I prefer using a cold brew coffee because of the smoother taste. 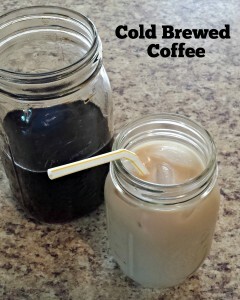 I promise you will LOVE this easy Cold Brewed Coffee. Calling it a “recipe” seems a bit of a stretch because it’s so easy to make. I usually “brew” & store my Cold Brewed Coffee in quart-sized mason jars, and the proportions of this recipe work perfectly for the quart sized jars. The mixture does need to brew for about 12 hours, so you will need to plan ahead. You can easily adjust the quantity of this recipe by increasing/decreasing the proportions – use 1/4 ground coffee per 1 cup of water. I’m thinking it would be awesome to fill a sun tea jar with this brew. I hope you enjoy this as much as I do! I love iced coffee, but I don't love paying coffee shop prices - over $3 a cup here! 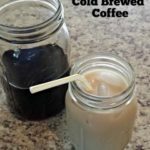 You can make this batch of Cold Brewed Coffee for less than a dollar - about 50 cents to be exact. Add ground coffee to a quart-size mason jar or bowl. Add 3 cups water & gently stir to wet the coffee grounds. Let the mixture sit on the counter for 15 minutes, then stir gently. Cover the jar or bowl, and store in the refrigerator for 12 hours. Strain the mixture through a coffee filter into a clean storage jar. I usually lower the filter into the jar creating a "cup" of sorts, then secure the filter with a rubber band. To make iced coffee, simply add ice to glass, fill to halfway mark with Cold Brewed Coffee, then fill the remainder with milk of choice (I use 1% milk with a splash of half & half because I usually have it on hand. Can also be sweetened and/or flavored. Easy peasy! Keeps for a week in the refrigerator (maybe longer but mine never lasts that long). Nutritional information provided as a reference.